“Restaurant Week” business and tourism marketing began in 1992. New York City hosted the Democratic National Convention that year, and renowned restaurant reviewer Tim Zagat and Manhattan restaurateur Joe Baum persuaded several of the city’s top restaurants to participate in a coinciding “$19.92 lunches” promotion. As they say on Broadway, it was a smash hit! Building on that success but now typically repositioned as an event to increase business during what might otherwise be “slow” or “off-season” periods, many U.S. cities now offer their own versions of the promotion. As you might imagine, various California cities get in on the fun in a BIG way. The tourism board for the State of California, in fact, kicked things up a notch in 2010 with a California Restaurants Month celebration. You can use the following California Restaurant Weeks list to get a general idea about which California cities and areas offer Restaurant Week / Restaurant Month events and when they do so (or, perhaps, when they are likely to do so should your visit fall between the time when a new year’s date is announced by a host city/county, when their website is updated with that information and/or when we hear about it and our website is updated). If you’re interested in a specific area, you should definitely click through to follow the link to see if the host city/county’s website has been updated, as I’m not automatically notified when that happens. If you have a moment to pop me a message when you find information at a link has been updated, that would be awesome… but it’s certainly not necessary… planning your awesome California vacation is the important thing! An email and/or phone call to the local (and, in my experience, very helpful) various Conventions and Visitor’s Bureaus for California’s cities/counties or even a stop at the state’s California Tourist Information and Hospitality Centers may also be useful to you for researching restaurants to try in a particular area. We are in the process of updating the list for 2017 (as of December 20, 2016), noting any 2015/2016 dates for which there isn’t an update yet available with an triple asterisk (***) to avoid confusion. Los Angeles – Known as “DineLA,” this promotion runs January 11-25, 2019***. [link] Remember, Los Angeles Restaurant Week extends to establishments in Pasadena, Hollywood, Santa Monica, Long Beach, etc. Check out the link for all the current details! San Diego – “America’s Most Beautiful City” typically hosts two Restaurant Weeks each year. This year’s dates are January 15-22, 2017 and September 24 through October 1, 2017. [link] There are some North County San Diego restaurants on the list, as well. Check out the link! San Luis Obispo County – This Central Coast county will celebrate annual Restaurant Month with a variety of restaurants in various cities (Paso Robles, Pismo Beach, Morro Bay and more) offering a 3-course, prix-fixe menu for only $30. January 2-31, 2017 [link] There are even some wineries getting in on the fun this year! Ventura – It looks like there are some Ventura County restaurants participating in the Los Angeles Restaurant Week festivities in 2017 (see link above). California Restaurant Week / Restaurant Month events offer a great opportunity to enjoy affordable “prix fixe” (set price) meals at some of the state’s top restaurants, so “bon appétit!” or “come and get it!,” whichever works for you. The events are so good, they’re almost worth planning a California vacation — or two — around them! 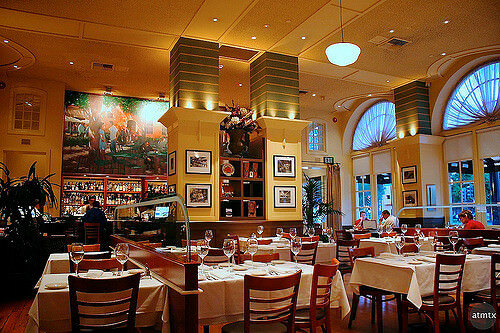 Photo of Il Fornaio restaurant in San Jose, CA by atmtx via flickr (Creative Commons).